THE Minister of Development, Pehin Orang Kaya Indera Pahlawan Dato Seri Setia Awang Haji Suyoi bin Haji Osman said the construction of the bridge linking Chung Hwa Middle School in the capital helps to reduce accidents involving students crossing the busy road. Speaking to the media on the sidelines of the official opening and the handing-over of ‘Ong Tiong Oh’ Bridge, the minister said students and pedestrians would no longer be exposed to such mishaps and congratulated Ong Tiong Oh, who is also the Director of Low San Hardware, for sponsoring the construction of the bridge. “We also have the National Road Safety Council to look into the situation. In other schools, there are also plans to build overhead bridges,” Pehin Dato Seri Setia Awang Haji Suyoi said. The construction of the bridge was also highlighted at the Legislative Council meeting way back in 2009 by YB Pehin Kapitan Lela Diraja Dato Paduka Awang Goh King Chin where he voiced his concern over the safety of students crossing the road to and from the Chung Hwa Middle School. 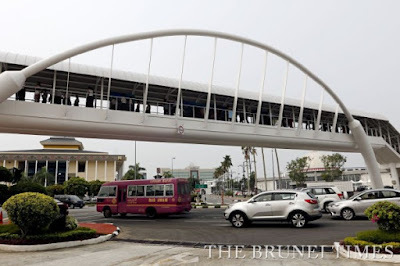 Meanwhile the Managing Director of Bolton Hennessey Sdn Bhd, Kueh Nge Wei who is also the main consultant for this bridge project told the Bulletin that the contract price is about $780,000. But due to over-run of the service of relocation, bridge costs around $800,000-$850,000. The main challenge was there were a lot of service utilities on both sides of the bridge when digging, such as the telecom and electrical cable, waterline and so on. These have to be relocated elsewhere before construction could start. “In addition, the bridge is about 43-metre long. We need two cranes to lift the bridge where we need to synchronise the traffic for safety reason. We need to put a medium at the centre of the bridge to support the bridge which is in a very narrow area. Moreover we could not do the lifting in the morning due to heavy traffic but have to do it at night. The bridge was first used when the third term school season reopened last week,” he added. When asked on reports circulating in the social media claiming that the recent Chung Hwa Middle School fee hike is related to the construction of this bridge, Mr Kueh said it was two separate issues. 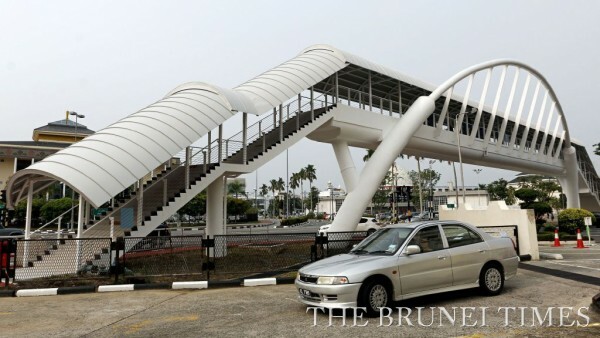 “The initiative to construct this bridge with the assistance of Mr Ong was made way back in 2007, which was before the fee hike imposed by the Chung Hwa Middle School announced recently. “With this explanation, I hope it would clear the air as such matter was raised in social media. The fee hike was made to the Ministry of Education about two years ago. Mr Ong donated close to a million dollars to sponsor this bridge,” he concluded.